The Mind Body Harmonizer is a device similar to what is known in North America as a relaxation and stress management device providing mild AC brain stimulation. AC stimulation, since it does not polarize the brain like DC, is harmless at any frequency as long as the current applied is in the range of less than 1 milliamp. In Europe it is called “ElectroSleep” and its marketed to relax people who cannot sleep. The mind body harmonizer is used as a relaxation and stress relief device which may also assist with Meditation and Lucid Dreaming. Various frequencies of stimulation of the earlobes has produced different effects. Some frequencies are better than others for relief of stress and relaxation. Traditionally all Bob Beck machines used 100 hertz, 14.3 hertz and 0.5 hertz which we included in our design. Our machine is a consumer device oriented towards relaxation, stress relief and amateur self research. We have added the 40hz stimulation to interest amateur researchers experimenting with meditation and lucid dreaming. It’s effects in these areas are yet to be determined. We looked into modern neuroscience to select 40 hz. The other frequencies are traditional relaxation device waveforms. The middle setting uses a 13.4 hz waveform which is the second Harmonic of the electric field of the atmosphere. This was added because other consumer relaxation devices all have offered it for decades. Only the 40 hertz Standard setting is based on actual brain wave research. The Relief setting uses traditional standard 100 hz waveforms for relaxation that have also been used in consumer devices for decades. We put great care into the quality of the machine. In our version called the Mind Body Harmonizer we designed unique waveforms based on literature and reverse engineering research. Stimulation uses 5 to 24 volts in which each ear alternately becomes positive or negatively charged, resulting in a zero DC offset applied to the brain. You limit the current from 0 to 1.0 milliamps with an intensity knob to a comfortable stimulation. It is similar to micro-tens. This is significantly less intense than many consumer grade stress management stimulator devices. Such consumer devices have been on the market from the 1980s and earlier. This technology has been proven to be safe from its first use in 1902 to its widespread use throughout the world as a consumer relaxation device. The waveform is open source to encourage publication ease. The Mind Body Harmonizer is based on open source designs by Bob Beck with the use of modern electronics. All frequencies used from 0.5 herz to 1000 hertz were found to have benefits by Bob. The Mind Body Harmonizer uses 909 hz in all its waveforms just to act as a carrier to move the stimulation signals through the transformer which is used for electrical isolation safety. It uses 40 hertz and 909 hz in the Standard setting, 100 hertz, 0.5 hertz and 909 hertz in the Relief setting and it uses 909 hertz and 14.3 hertz in the Meditation setting. 909 hz was selected because it is greater than 500 hz which is the maximum frequency the brain can detect. Two waveforms at 909 hz happen every 1/40th second in the Standard Setting. The brain cannot adapt to the 909 hz trigger frequency and thus the device will work for years without fading like drugs. Electric stimulation for relaxation is much older than its USA use, going back to 1903 in France and much earlier. Electric Stimulation was used by ancient Roman doctors with electric fish for health improvement. In ancient Egypt electric fish were used for health. This type of tool remained popular in almost all countries worldwide from 1840 to the present time. Our device is meant to brighten the mood, for relaxation, stress management, experimentation with lucid dreaming and to assist meditation. The Harmonizer is based on traditional stimulation tools for relaxing and reducing stress developed in 1902 in France and later refined in the 1980s by Bob Beck. Bob, an electrical engineer in the 1990s, designed and published documentation on a number of mild electronic stimulation devices used on the ear lobes for relaxation, concentration and stress relief. We have improved upon Bob’s original design to make it gentler and more versatile. The Mind Body Harmonizer is based on the non-patented, open source work of Bob Beck. He wanted the world to benefit from the concept without it being locked down by a corporation. There are many such machines sold in Canada and the USA, marketed simply for relaxation and stress relief. We worked with Bob Beck’s open source design and consulted modern neuroscience knowledge to come up with a more effective tool for Relaxation, Stress Relief and we added a Meditation assistance frequency. 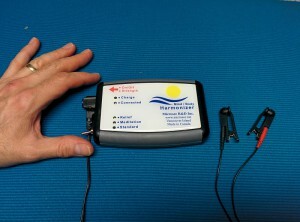 We manufacture the improved device under the name Mind Body Harmonizer. We have open sourced the design in the spirit of Bob Beck’s work. Ian Soutar, inventor of the Mind Body Harmonizer, worked for the National Research Council in Ottawa instrumenting solar energy collection systems from 1984-1985. He founded Microsec R&D in 1986 to provide product design services for inventors and industry. He is partners with another inventor Ed Haslam and both do microcontroller based product designs. They have been granted 6 patents for unique designs. Currently Microsec R&D Inc. is doing manufacturing of their own products for relieving stress and helping with relaxation, and to promote healing through pulsed magnetic fields or PEMF. A Gentle Brain Stimulation tool for Relaxation & Stress Management. An experimental tool to help Canadians relax and avoid stress. Based on traditional elecro-medicine tools for depression, stress, addiction & chronic pain. Our innovations are called “Harmonic CES”. In the Standard setting, the machine stimulates using a natural brain frequency of 40 hertz which is the Gamma brainwave frequency of a healthy brain. Gamma brainwaves decline with age and are not usually present in depressed people.